Adenosine diphosphate (ADP) is an organic molecule which plays a central role in cellular metabolism and energy transfer reactions. ADP is a product of ATP de-phosphorylation and can be rephosphorylated to ATP or further de-phosphorylation to AMP. This cycling of ADP is central to transferring potential (thermodynamic) energy from one source to another. Besides its involvement in glycolysis, citric acid cycle and oxidative phosphorylation, ADP is also stored as dense bodies in blood platelets. Upon platelet activation, ADP is release which leads to further platelet activation through APD receptors (1-8). 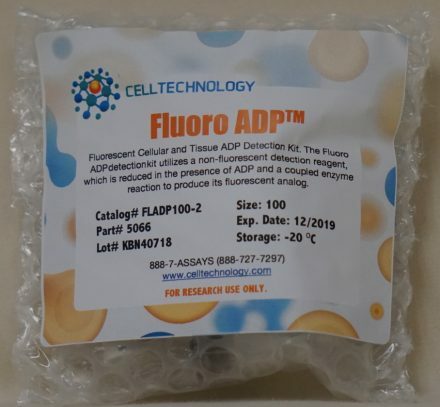 Cell Technology’s Fluoro ADP assay provides a reliable, sensitive fluorimetric assay for the quantification of ADP in biological samples. Detection of ADP in cells or tissue extracts. Detection of ADP in cell death, energy metabolism, mitochondria function. ADP measurement in ATP consuming enzymes such as Kinases and ATPases. ADP detection in Bacterial, Fungal and Plant Cells. Fluorescent 96 well Plate Reader Readout (excitation: 530-570nm and emission at 590-600nm). The Fluoro ADP detection kit utilizes a non-fluorescent detection reagent, which is reduced in the presence ADP and a coupled enzyme reaction to produce its fluorescent analog. There is a linear relationship of ADP concentration to the fluorescent analog concentration. An ADP standard curve is generated to interpolate sample ADP concentrations. The kit can be used in both endpoint and kenitic modes. Figure 1. ADP vs ATP Standard Curve fitted with linear regression. Table 1. ADP was spiked into Jurkat cell samples. % Recovery was determined via linear regression from ADP standard curve. N=3 per sample. Bailey, Regina. "10 Steps of Glycolysis"